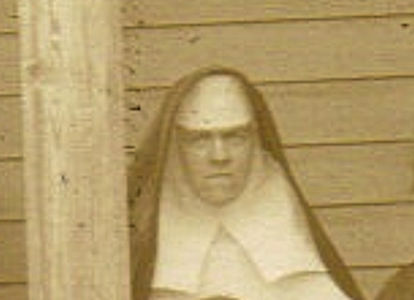 Sister Mary Monica Savage, R.S.M. See Sr. Mary Joachim for description of Reception Ceremony. The bells for the celebration of the golden jubilee of Sr. M. Joachim Savage, R.S.M., Were hardly silenced when the toll of the passing bell announced that her sister, Sr. Mary Monica Savage, R.S.M., had been called to her eternal reward. Death came to Sister M. Monica, quietly and suddenly. Shortly after the evening angelus on August 24, 1945, the infirmarian found her. She had gone from hours of earthly vigil before the throne of the master in the chapel of Mount St. Mary Academy,Oklahoma City, OK, to the everlasting Presence of Him Whom she had been adoring. For four years previous to her death, she had been in failing health, but she continued to attend all of the religious exercises. The greater part of Sister Mary Monica’s religious life was spent at St. Mary Academy, Sacred Heart, Oklahoma. Quiet and unassuming, Sister was noted for her charity and her prayerful life. In his sermon at the Requiem Mass which was celebrated by Rev. Edward Soler, O.C.D., Rev. P.I. Wilwerding, chaplain to Mount St. Mary Academy, in speaking of Sister Mary Monica used the text, “I must be about My Father’s business,” which was so appropriate to her life of obedience and submission to God’s Will. Father Wilwerding told of her great desire to be of help to the Indians, and of the zeal with which she carried on her work at Sacred Heart, Krebs, Shawnee, and Ardmore. He mentioned his gratitude at being allowed to minister to her during her declining years and to share in the inspiration which she gave to all who came in contact with her. MINISTRY ASSIGNMENTS of SISTER MARY MONICA SAVAGE, R.S.M. 1932-1940 Sacred Heart, OK St. Mary Academy Chapel, etc. It is anticipated that Indian children were enrolled in all schools in Oklahoma. It is also possible that children from other tribes were enrolled.